Kingfisher K-X11 Waterproof Admixture is a copolymer blend of latex and acrylics. When added to mortars K-X11 dramatically improves the characteristics of the mix, providing water resistance, adhesion, strength and flexibility to both renders and screeds, to help make your building waterproof. Water is very important to the production, placement and curing of concrete. Once the concrete production has been completed, water becomes a foe. Concrete can perform well in wet climates but as a naturally porous material, it can be exposed to cracking. This can result in the deterioration of concrete because of corrosion to the embedded steel reinforcement. There are a wide range of benefits to using the Kingisher Waterproofing Admixture. Our waterproofing admixture for mortar can increase the durability of concrete, reducing maintenance costs. It is also very cost effective compared with other membranes and systems and helps you to save time at the design and construction stages. This is because there will be no need for external membranes that can be complicated to install. We have a wealth of experience in waterproofing, so you can rest assured that we only provide the finest products. This ensures that concrete waterproofing is easy, offering added durability and longevity to concrete. So, if you are looking to make concrete waterproof, look no further. 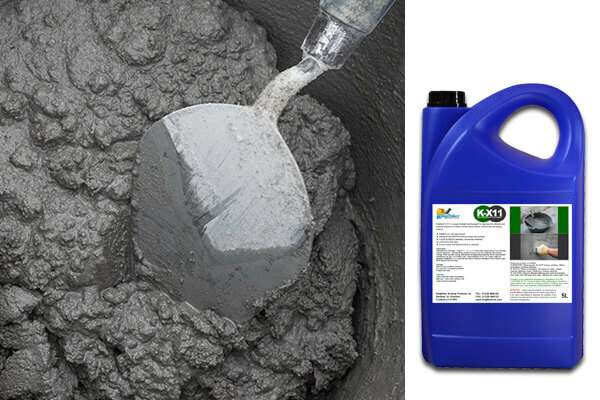 This waterproofing admixture for mortar will help you to make the perfect waterproof concrete mix. K-X11 is an absolutely essential waterproof component in our Tankit and Aquatech membrane systems. Request data sheets for further information.